Electronic Kit School. - As we know that upper and lower voltage in our home can cause adverse effect that dangerous for many house electronic devices and appliance. So, there are many method to solve this problem like to limit the high and low voltage. 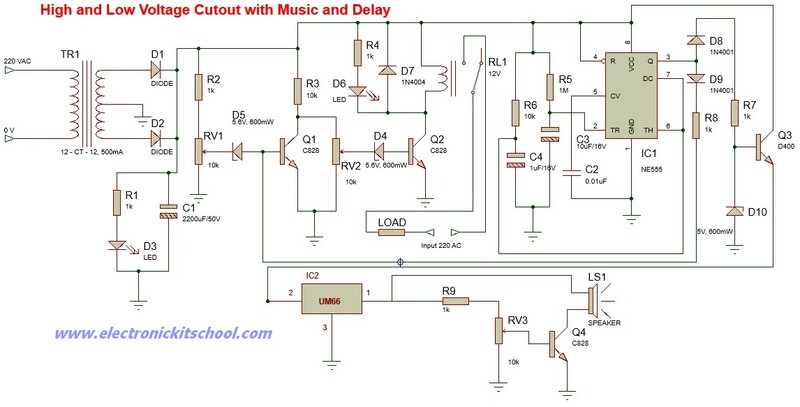 In this article we will give you one electronic circuit that can give you high and low voltage cut-out automatically which completed with music and delay system like in Figure 1 below. The main components are used in this circuit are NE555 as time astabe multivibrator and UM66 served as a music generator component. Circuit like in Figure 1 above show you about the high and low voltage cut-out circuit that completed with music and delay. This circuit build to protect house appliance or electronic devices from damage because of adverse affecting of voltage. Assume that the DC voltage at the cathode of zener diode D4 is less then 5.6V when mains voltage is normal. This condition make the transistor Q1 is in off state. It will make the DC voltage at the cathode of D5 zener diode is greater than 5.6V and as make the transistor Q2 is in on state. Consequently, relay RL1 gets energised, which is indicated by lighting up of green LED. Under high mains voltage condition, transistor Q1 switches to on state. It is because the voltage at cathode of zener diode D4 becomes greater than 5.6V. It is will make the transistor Q2 switches to off state and make the relay to de-energise. In under low mains voltage condition, the transistor Q1 switches to off state and as a result transistor Q2 also switches to off state. It is making the relay to de-energise. Timer from astabe multivibrator of IC 555 in the circuit is configured to operate in a monostable mode. The pulse width of this operation is about 10 seconds with the timing component values used in the circuit. Pin 2 of IC1 555 goes low briefly and this triggers it, when the power resumes after a break. The output of this IC will make music IC2 UM66 to operate through transistor Q3. Simultaneously, transistor Q1 also gets forward biased as the monostable IC1 output is connected to its base via diode D9 and resistor R8. This is make the transistor Q1 conducts and biases transistor Q2 to cut off. So, relay RL1 remains de-energised for the duration of mono pulse and the load is protected against the voltage surges. You may use a manually variable auto-transformer to adjust presets RV1 and RV2. Set the output of auto-transformer to 270V AC and connect it to the primary of transformer TR1. Adjust preset RV1 such that relay RL1 just de-energises. Next set the output of auto-transformer to 170V AC. Now adjust preset RV2 such that relay RL1 again de-energises. Volume control RV3 may be adjusted for the desired output volume of the tune generated by the IC UM66.